Our balanced Red Clay Stain Remover is buffered with water and surfactants to only micro etch the concrete, thus removing the red clay but not adversely affecting the surface. Apply the Red Clay Stain Remover using a hand pump sprayer, let sit for 3 to 5 minutes and then power wash off. It's important to use a power washer so that you move the clay completely off the surface. Otherwise the red clay may resettle in another area. 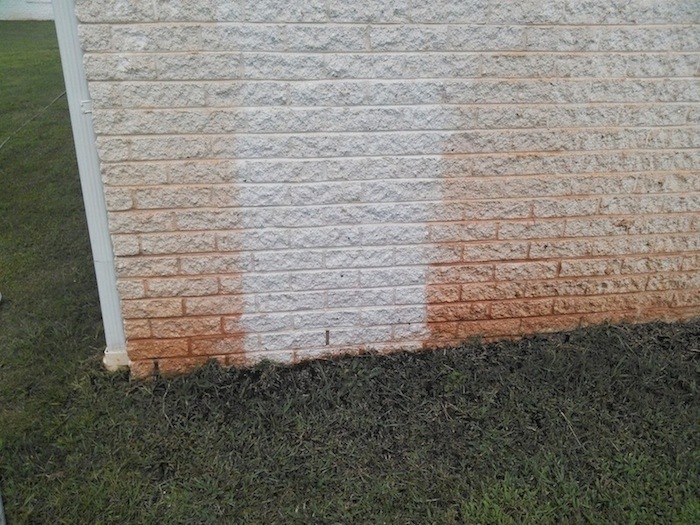 The picture below (compliments of Dionne Thompson of Detail Pressure Washing in West Union, SC) shows our cleaner taking off red clay stains from a brick foundation wall.